This book showcases how language learner agency can be understood and researched from varying perspectives by providing, for the first time, a collection of diverse approaches in one volume. The volume is organised into three main sections: the first section offers an introduction to the theoretical background of agency as a construct; the second section presents analyses of agency in a variety of empirical studies; and the third section focuses on the pedagogical implications of data-based studies of agency. The volume includes the work of researchers working in languages including English (ESL and EFL), Greek, Spanish, Swedish, Italian, Hindi, Marathi, Gujarati and Truku (an indigenous language in Taiwan) and with both child and adult language learners. This collection will serve as a key reference for researchers of language learning and teaching, sociolinguistics and language and identity. This volume thoroughly surveys the different approaches to the question of?agency in second-language learning. A particularly?strong point of this volume is the range of learning contexts that are presented. This focus on a range of unique learning experiences emphasizes?the richness of agency as an area of research in second-language learning. ?This book will be a valuable?resource for postgraduate students, teachers, and researchers of agency, ?identity, and second-language learning. - David McLoughlin, Meiji University, Tokyo, Japan - Applied Linguistics 2016: 1 5"
In an educational environment increasingly driven by market-place concerns and forms of hyper-regulation, careful assessment of the potential for teacher and student agency is a most timely and welcome development. 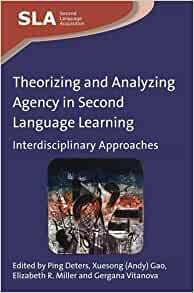 This is an outstanding collection of theoretical and pedagogical perspectives the go to book on agency in second language education. - Brian Morgan, Glendon College/York University, Canada"
In my opinion, the greatest strength of the book lies principally in it being?an interesting collection of different perspectives from which agency in language learning can be viewed, as well as a first-class?inspiration for readers to reflect and even take action in the context of multiple agency on issues raised by the?contributors. Therefore, the book itself can mediate agency in both scholars and practitioners, be it through their researching?or replicating the various study proposals, or implementing the contributors insights into their own language classrooms. - Dorota Werbinska, Pomeranian Academy, Poland - System 50 (2015) 69-77"
--Dorota Werbinska, Pomeranian Academy, Poland "Manka Varghese, University of Washington, USA"
--Dorota Werbinska, Pomeranian Academy, Poland "Mingyue (Michelle) Gu, Chinese University of Hong Kong, Hong Kong"
--David McLoughlin, Meiji University, Tokyo, Japan "Applied Linguistics 2016: 1-5"
In my opinion, the greatest strength of the book lies principally in it being an interesting collection of different perspectives from which agency in language learning can be viewed, as well as a first-class inspiration for readers to reflect and even take action in the context of multiple agency on issues raised by the contributors. Therefore, the book itself can mediate agency in both scholars and practitioners, be it through their researching or replicating the various study proposals, or implementing the contributors' insights into their own language classrooms. --Dorota Werbinska, Pomeranian Academy, Poland "System 50 (2015) 69-77"
In an educational environment increasingly driven by market-place concerns and forms of hyper-regulation, careful assessment of the potential for teacher and student agency is a most timely and welcome development. This is an outstanding collection of theoretical and pedagogical perspectives - the 'go to' book on agency in second language education. --Dorota Werbinska, Pomeranian Academy, Poland "Brian Morgan, Glendon College/York University, Canada"